Chances are you’ve been thinking about construction as a vocation for a while but haven’t taken the necessary steps to make it happen yet. Maybe you want to graduate high school or finish your associate’s first. Or perhaps you’re unsure how your family will react. Maybe it’s even you who’s questioning whether it’s the right path because you don’t know if you’ll earn enough to make a decent living. These are all important questions to ask before starting a heavy equipment training course, but let us ease your mind on at least one thing. We can share with confidence that jobs in this industry will grow 12 percent through 2026, faster than the average rate. Plus, the median income for construction equipment operators was more than $46,000 per year, or $22 per hour, in 2017, according to the Bureau of Labor Statistics. But a growing field with good pay isn’t the only reason to attend a training course, and it’s certainly not the only reason to sign up for ours. Here are four reasons why our West Coast heavy equipment training is your best bet. Admittedly, most of our students are from the West Coast, but we accept applicants from all over, and we’ll put you up in a place to stay no matter where you hail from. Once you arrive, you’ll receive transportation from the airport to your new digs for the next few weeks at a nearby motel. Yes, you’ll have to share a room if you want a full free ride, but you can expect a comfortable double bed and free transportation to and from your quarters and school each day. Not into roommates? We have other options, too, that include shared apartment living and solo motel rooms for an added fee. You’re making an investment in yourself when you choose to gain an education at West Coast Training and your tuition should work for you. So it includes all courses, books, material usage, and your room and board. We want you to focus on your future, and we do our best to set you up in a place where you’ll feel comfortable and can easily get back and forth to school and work and the nearby stores. Here, you’re not just going to sit around in lectures and read about what you’ll do in your future construction jobs. Yes, that is included as safety is of the utmost importance and it’s necessary to know about the machines before you hop into your seat, but our focus is on providing extensive hands-on, real-life experiences. Once in the field, you’ll never be sitting around. At our West Coast heavy equipment training you will find small class sizes so that you can gain the undivided attention you need to learn, and you’ll never have to wait to use a machine. 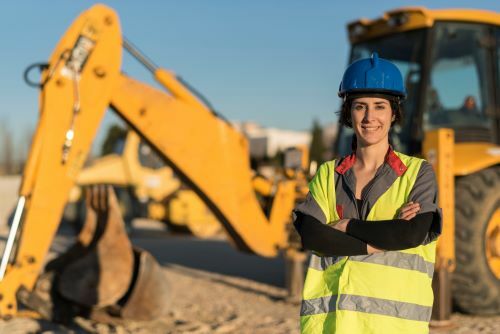 When it’s time to learn to operate a crane, backhoe, digger, dozer, grader, excavator, or any other number of heavy machinery, you’ll be doing just that. Or you’ll be learning how to guide your teammates to perform a task, switching off and on between directing the action and engaging in the task at hand. Skills could include a blind pick—the operator is blindfolded and reliant on his/her teammate for direction—tandem lifts— two cranes lift one object—assembling cell towers, and hanging iron. While we cannot guarantee employment once you’ve graduated from our West Coast heavy equipment training course, we do have a dedicated team available to help you get a job once the time comes. After you pass your exams, our employment services representative will assist you with constructing your resume, practicing for interviews, and even guiding you to available employment in the location and niche of your choosing. We have resources throughout the US, so no matter where you come from or where you want to go, if you select West Coast Training as your educational resource, our team will be dedicated to finding you the best job placement possible. And this is a resource you can use throughout your career. Simply give us a ring and we’ll let you know of any job opportunities that meet your criteria. It’s true that working with heavy equipment is inherently dangerous. With this in mind, we place a significant emphasis on safety. This protects us. It protects you. And, as a bonus, it makes you even more attractive when you apply for jobs. It used to be that you could just walk onto a construction site and get a job. That is occasionally still true, but if you really want to maximize your career and set yourself up for success, both in safety and potential income earning, your construction career should start with the proper education. There are other schools beyond our West Coast heavy equipment training program, but our focus on safety should be the tipping point for why you should join us, even if everything else is equal elsewhere. At West Coast Training, our priority is your education and setting you on the right path for a successful future. We’ve developed our program from years of experience in the industry and on construction sites, and we know what it takes to develop an accomplished career. We’ve compiled all we’ve learned with the addition of new techniques and advancements that continue to evolve to provide you with the highest-quality training. While we shared four reasons we rise above the rest, there are many more benefits you’ll gain, and we look forward to sharing those with you soon. Reach out to our team today and see if West Coast Training is the place for you.